The morning started early because we had to catch a tour bus on the other side of Shanghai. We will be touring a contemporary village that has been almost 100% preserved without modernization. The village is Wuzhen about two hours west of Shanghai. We caught the bus at the Shanghai Stadium where the Women's World Cup games were played and the Special Olympics just concluded. 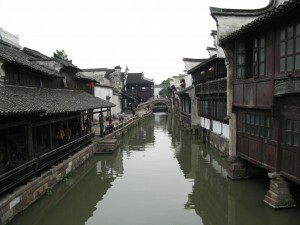 Wuzhen is a village located on a waterway, complete with picturesque bridges. This village was preserved as is, only maintained to keep structures intact, no painting, no new businesses. This approach was taken as a result of other preservation actions taken at other old villages that became so commercialized that the attempts failed to preserve the uniqueness of the villages. One of the negatives initially of Wuzhen was thay only the old grandparents and the grandchildren remained while the parents abandoned the village to earn money elsewhere. Actions have been taken to attract the younger people back but from our observations they still have a way go. The village has maintained its character. Very narrow lanes between the homes, trades maintained, such as shoe making, cloth dying, weaving, carpentry. I almost forgot about the 100 proof (50%) Spirits Distillery. WHOA! It was nice that most of the demonstrations had English descriptions. One note is that we were the only Westerners I saw the whole time we were there. Photo ops abounded. I was a little bothered by the appearance that these residents were on display. Hundreds of fellow Chinese (tourists) walking by, observing these people in their daily life. Not once did I observe them being greeted or spoken to by their fellow Chinese. When I greeted them with a smile and a 'Ni Hao! (Hello! )', it was a pleasure to get a wide grin, a wave and a 'Ni Hao!' back. I so wish I could have stopped and talked with them in their language. One woman was just standing looking out over the water and was startled when I waved. But she smiled a big grin and waved back. I saw her from across the water a half our later and this time she was quick to recognize us and smiled again and waved back. The government bought the homes from them and then rents them back to them on the condition that they live and maintain their life style in the village. They are allowed to make and sell their goods. They go about their daily lives, but under a magnifying glass. They were allowed to build some small businesses including restaurants on the edges of the village to attract some of the younger people to come back to the village. We had a quick simple lunch in one of these before we left to return to Shanghai. On the way back we stopped at a 1500 year old Buddhist monastery and then again later stopped at the obligatory tourist mall where we sat through what I call an 'infomercial' to buy chrysanthemum tea. I didn't understand a word of the spiel but it went something like this: One container of tea costs 70 yuan but if you buy three containers for 200 we'll throw in this other smaller container for free.? After the infomercial we were funneled through a large warehouse where stalls of fresh and dried fruit, leather goods and clothing were being sold before re-boarding our busses for a long ride back to Shanghai. After returning home we went to the apartment complex club for dinner, this time choosing western food. We need to start getting used to our style again. I had a great pork chop dinner and Carol had a fresh chicken salad. Wow! I can still use a knife and fork! On both sides of a slabstone-paved street stand pubs, restaurants, pawnshops, weaving and dyeing establishments, and other businesses, all housed in wooden structures of brown. Rivers and creeks spanned with stone bridges in various designs flow through the town, and the Beijing-Hangzhou Grand Canal passes by. Old waterside houses and outside corridors can be found here and there. This is the ancient town of Wuzhen. Wuzhen Town, in Tongxiang City, Zhejiang Province, has a history of more than 1,000 years. Of the ancient residential houses, workshops, and stores still standing on the banks of the rivers, 169,600 square meters, accounting for 81.54 percent of the town's total floor area, have remained unchanged, lending an atmosphere of antiquity. Wuzhen has many sites of historical and cultural interest. From the Song (960-1279) through the Qing (1644-1911) Dynasties, Wuzhen produced more successful candidates in the highest imperial examinations than any other town south of the lower reaches of the Changjiang (Yangtze) River. Bearing witness to the town's emphasis on education is the Lizhi (Aspiration) Academy of Classical Learning of the Qing Dynasty, which still retains its original appearance. The raw material for dye printing is Eupatorium fortunei, a herb that turns into indigo after being fermented and precipitated. For convenience in transporting the cloth, the weaving workshops and dyeing workshops are usually on the same street, only a few doors from each other. At the dyeing workshop, the cloth is soaked and air-dried again and again to produce white flowers on a blue background. 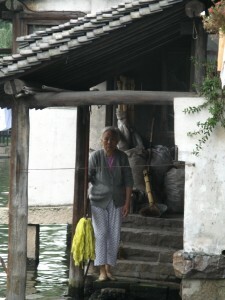 People in Wuzhen live a simple life. Many of them breed silkworms and raise chrysanthemums, and they have mostly retained the tradition of buying fruit and vegetables from trade boats through the windows of their waterside houses. They benefit from an inherited harmony of man and nature and enjoy the pleasing living environment that comes from social progress. In May 1999, the local government invested 200 million yuan for maintaining and improving the town's environment. The project was to be completed within five years, and the first phase, with an investment of 80 million yuan, was completed by the end of 2001. While taking care to retain the town's original look, efforts have been made in the treatment of the water environment, the renovation of public toilets, the installation of outdoor lighting, and the management of the sanitation and appearance of the town. A clean, beautiful environment has thus been ensured.